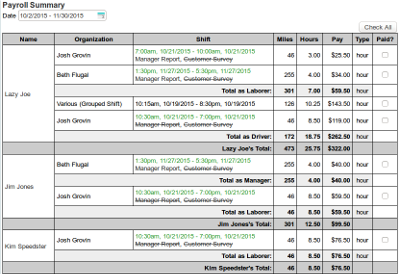 Schedule event staff & delivery crew, worker shift notifications, sales reps tracking, and payroll reports. 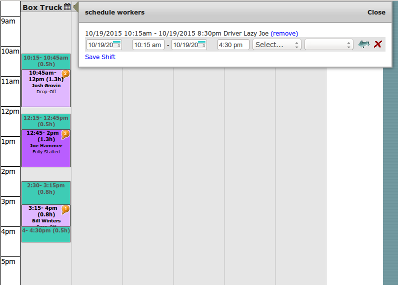 Schedule shifts and let your workers pick shifts that work best for them based on their position and rank. When making delivery schedules, schedule workers per vehicle. Enter worker schedules directly from the lead you are working on. Incentivize your sales reps by giving commission. 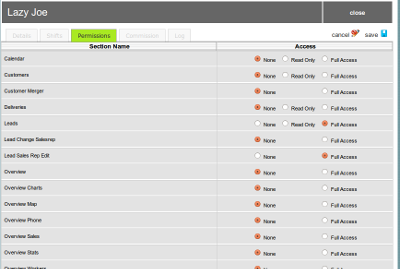 Multiple logins to track worker activity. 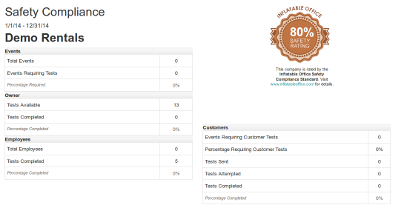 Easily see what sales your reps have made with our customizable reports. Setup each sales rep commission specific to that rep. Payroll reports show each commission line item for accountability. Permissions can be set to allow others to work on a sales rep lead without taking credit or only allow the rep that claimed the lead. Available shifts to sign up for. Important documents like the customer contract or packing list. Route information like directions or the ability to access all directions, contracts, and packing lists for routed trucks. The ability to enter equipment into or take equipment out of maintenance. See other workers shifts for management or informational purposes. Links to event reports that need completed for their events. 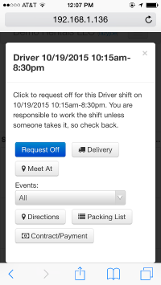 The option to request off and have other workers automatically fill their shifts. Hours and wages per worker for each position they worked and their totals. Mileages and mileage compensation for any worker designated to receive mileage pay. Payroll amounts for any contractors that get paid by the type of equipment they delivered. Sales commissions for any worker that is designated as a sales rep for an event. Remind them a few days and/or hours before the event via email and/or text messages. 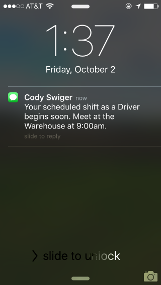 Require your workers to respond to the shift assignment. Allow them to accept or decline or just acknowledge seeing the shift. Automatically have shift changes sent to them. 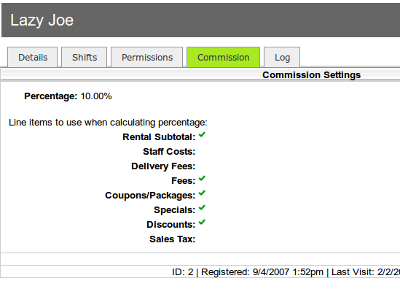 Send payroll information for the last pay period automatically for independent contractors. 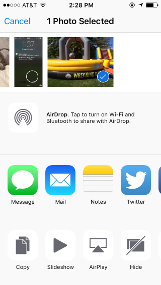 Provide separate logins for each worker and set permissions for all areas of InflatableOffice. Assign positions to make sure you get the right workers signed up to properly service your events. Set a rank to your workers to make sure that your best workers get first choice when signing up for events. Easily turn on/off worker accounts as needed. Ensure your managers are reminded to complete reports without any effort with our automatic reminder emails. Collect and save a complete history of the work your team does at every event by having them answer a survey after the event. 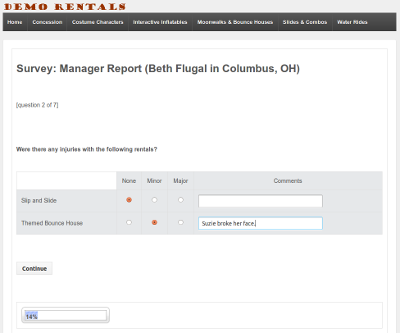 Workers can visit the surveys page on the worker site to see if they have outstanding surveys to complete. When equipment is damaged and noted on surveys, alert emails are sent immediately to the appropriate staff. Enroll your workers in our safety and training program. The program requires that every 9 months they complete each training test that is required for positions they hold. Workers get reminders to complete the safety training when their certification is expiring. Workers must get all questions correct to pass the quiz and can take the quiz as many times as necessary to learn the information. Workers are unable to sign up for shifts if they haven't passed the test for that position. We enable workers to document the event. Workers can send in pictures and video from their mobile phone, and it is automatically attached to the appropriate lead. Have your workers take photos of the units to ensure any damage is easily proven. Digitally archive all your setup and training checklists. Pictures of injuries can be documented in case of potential liability issues later.